" If i speak out in public, for or against any particular development it could be construed that i had unduly influenced my colleagues." Note - This page was written well before the 2006 elections. Any reference(s) on this page, to East Lothian Council / Local Councillors is applicable to the Labour controlled administration prior to the 2006 elections. The 'new' SNP/Libdem administration has yet to be properly tested on development issues. East Lothian has long been known as "The Garden County", and justly so. The high quality of the County,s agricultural land has for generations ensured an abundance of quality produce for both the local and wider markets, and has generated not only income but very welcome jobs. This was the Mair road before the builders arrived. A popular route for walkers & cyclists. picturesque villages which abound in the County it is very difficult to become bored of the endless variety. But thanks to builders who are only too ready to capitalise on the current vulnerability of many farmers, and a council - East Lothian Council - unwilling to oppose large scale development, irrespective of its effect on the local community, the peace and beauty of the countryside is under great threat. Presently in School Field, Aberlady, Cala Homes are building 93 houses. 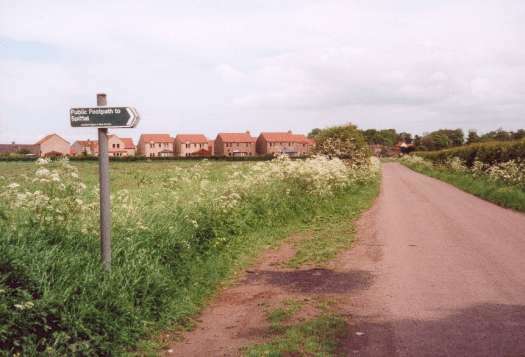 There were also proposals for 1500+ at Ballencrief ( South of Aberlady ), more at the former Aberlady Mains Farm, also the villages of Dirleton and Longniddry, the list is endless. What they all have in common is a total disregard for the existing communities. 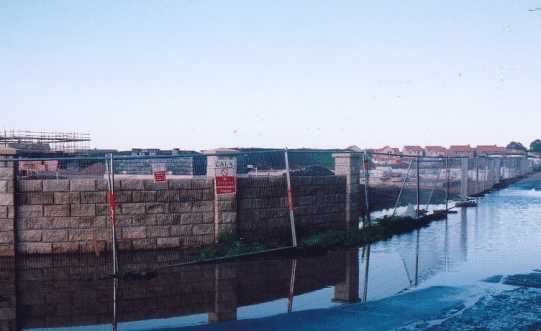 Mair Road flooded September 2002. Flooding was never a problem on this road until the builders arrived. In the School Field case, Secretary of the Aberlady Conservation Society, Ian Malcolm - in a television interview for BBC Scotland - described it as the "death of a Community", a feeling which is apparent as you talk to local people. The number of proposed developments being talked about and the total lack of opposition by East Lothian Council has led to comments in the press that East Lothian is fast becoming " The Builder's Paradise". What can be done to stop further inappropriate development in the area? As well as the local council becoming more proactive, members of the public have to get involved, rather than sitting back thinking all is lost. In Aberlady the Aberlady Conservation Society was formed and in other areas various groups are being created. Join one now before it is too late. Note: The code of conduct which Mr. Meikle was using as an excuse in his quote at the top of this page, was not even in force at the time. Note2: At a meeting of the Lothian Councils on 23rd December 2002 Councillor Costello - while commenting on future housing in the County - said that Developments would not go ahead unless the infrastructure was in place. We will let you decide if this criteria was used for the Cala development in School Field ( the feeder roads are substandard according to the Council's own regulations ). Please tell your friends about the The Aberlady Pages ( aberlady.net ) web site . Is your community under threat from inappropriate development(s)? What is being done to stop it? Let us know by posting in the forums here or by sending us an e-mail and we may highlight your experiences in the future.